Reference Sheet – helpful or not? So, last night BOSTES published the long-awaited “Reference Sheet” that HSC 2016 students will receive in the final exams for Mathematics, Extension 1 and Extension 2. The response in the teaching community that I’ve seen has been mixed. There has mostly been very positive feedback, but I’ve spoken with many who are (wisely) a little more skeptical. Is it a good idea? Is it “dumbing down” the course? As one of the teachers who gave feedback early on in the development of this sheet, I’ve been thinking about this for a while. Is it appropriate? Is it even helpful? Like the standard integrals sheet it replaces (which, as an interesting piece of trivia, is actually a page out of the old book of log tables), I think that most strong students will not really use this sheet and it will not change the way they think about or learn mathematics. It was certainly never my experience as a student that I relied on the standard integrals sheet, because I had used those results so often that I inadvertently memorised them. But this sheet is not designed for students who would have been in that camp (and most maths teachers, it should be noted, would be in this category – that’s part of why we’re maths teachers). This sheet is designed to help out the student who struggles a little more and can’t access a number of questions in the final exam because he can’t quite remember how the cosine rule ends. Or which sign belongs where in difference of cubes. This sheet is going to help them and give them a tiny bit of assistance – just like we all would use in the real world if we were trying to do something and couldn’t remember the formula. We’d look it up on Google! This is an attempt to make assessment less contrived in that way. Of course it isn’t perfect – every solution is a compromise with strengths and weaknesses. But I personally welcome the change. This entry was posted in Mathematics and tagged Blog. I’ve said this to my classes many times, but I don’t mention this enough in public. This entry was posted in Technology and tagged Blog. Corinne Campbell recently wrote a very helpful blog post that really made me think. She’s always a sharp writer who’s demonstrated again and again that she can see through trends that are more popular than they deserve. Some call it black hat thinking. I call it healthy cynicism, and I really appreciate that Corinne is willing to share her experience and insight with the rest of us. The post in question is a humble defence of “passive learning”. It’s a reactionary piece that provides a personal and insightful response to the preoccupation in educational circles to prioritise so-called “active learning” (where people are in groups and are involved in activities to develop their understanding and skills) over and against any style of learning where students (or, as Corinne writes, teachers in a professional development setting) are sitting and listening to one person presenting an idea or concept. Corinne’s thoughts struck me for two reasons, both quite personal to me. The first has to do with when I’m on the receiving end of “passive learning”, and the second has to do when I’m on the giving end. Like Corinne, I also really value the opportunity to sit and listen to a really clear exposition of a new idea or concept or system (or an old one presented in a new way). I think it’s a mistake to believe in some kind of hyper-constructivism that ascribes value only to activities strictly centred on the learner. And I think a big part of the problem is that there is a false dichotomy that’s been set up by the language used to describe what’s going on here. Case in point: when I’m trying to learn something in a “passive learning environment”, I’m not passive at all. I’m reflecting, pondering, categorising, critiquing and a hundred other metacognitive tasks as I listen. We need a new kind of language. Just because I’m considering another person’s ideas rather than contributing my own, that doesn’t mean I’m not constructing my own understanding. Contemplation is just as valuable as participation. Each has its time and place. We need both wings on the plane. Secondly, , Corinne’s validation of this kind of learning helps me make sense of something I’ve observed more and more of over the last 12 months. 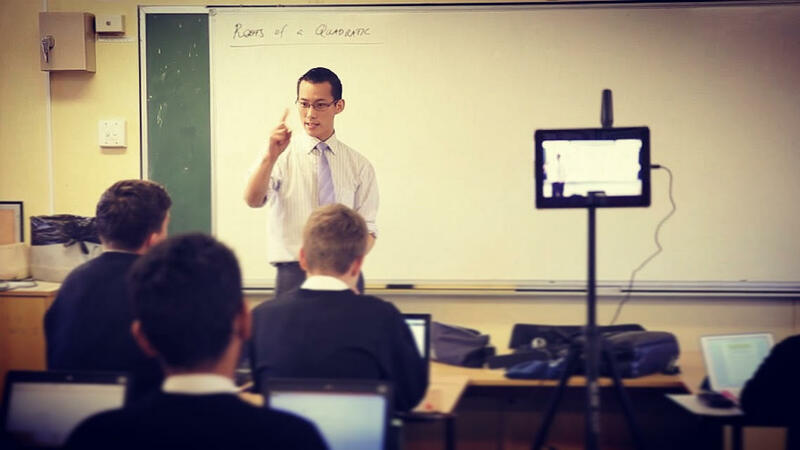 For three years now, I’ve been filming my classroom lessons and putting them up online – completely public and free (I’m a public education advocate – can you tell?). It’s not the flipped classroom, but it’s related to that idea. It was never intended as a medium to reach the masses – I literally only ever intended it to be used by a single person – and so I was immensely surprised to find a broad audience of people (both students and teachers) who started watching along and reporting to me that it was really beneficial to them. Just recently the Youtube channel passed 10,000 subscribers and 1.1 million views across all its videos. But amid this success, I’ve felt quietly guilty. Why? It’s because I know that, at its heart, my channel is a passive medium. Yes, I could use it as a platform for interactivity (and I have in the past) – but I have young children and I’m a head teacher, so frankly I have higher priorities for my time than fielding questions online (even though I’d love to be able to do that). So I am essentially using this technology to broadcast – that is to say, to replicate a “passive learning environment” in the homes of anyone who cares to watch. This is not the kind of technology that people are supposed to be excited about. The “active learning” movement (which I value and support) is supposed to be about using technology where it helps students investigate, create and collaborate – not to consume content. So in many ways, I feel like I’ve been swimming in the wrong direction. But it’s not true. I’m providing something that is genuinely helpful to a broad range of people and I’m not going to be ashamed of that. I am opening up an avenue for students to do what I myself appreciate so much: to ponder a counter-intuitive idea, to be led on a journey to understand new things, and to see the world in a different way. That’s awesome and it’s worth celebrating. So I’m resolving not to talk about passive or active learning any more. I’m going to think about whether I or my students are learning by contemplation or learning by participation. As educators and learners, we need them both. This entry was posted in General and tagged Blog. This article was originally published as a series of posts at the ment2teach blog. That’s why it’s a bit longer than what I usually write – this is actually three posts rolled into one. Enjoy. Maths is missing a crucial ingredient. Have you ever prepared a meal without all the right ingredients? I remember the time I was making sushi and forgot to add rice wine vinegar to the rice, and the result wasn’t bad but it tasted pretty flat. Or once, when I was experimenting to try and re-create an old family classic, and the flavour was turning out positively wrong because I was missing the secret and impossible-to-guess component. Trying to cook while missing some of the ingredients you need is a bad idea. In our maths classrooms, many of us are falling to the same error. It is mostly well-intentioned; many of us don’t know any better because we have (as is typical among teachers) defaulted to the way we were taught, and that isn’t always best practice. But it can be (pardon the pun) a recipe for disaster. What’s the missing ingredient? Maths is an intensely personal subject – and we have forgotten that. Maths is missing a sense of how personal it is. As a primary and high school subject, maths has developed a reputation for being dry and unemotional. It has even entered our vernacular to say someone is “cold and calculating” when referring to a person who lacks empathy and compassion. But on the positive side, mathematicians who enter the world of mathematics after school often report back that maths has a thrillingly personal side. They sometimes describe their mathematical endeavours as a collaborative journey of intense mental and emotional energy with a tremendous personal pay-off. The french mathematician Cédric Villani wrote: “Mathematics is about progress and adventure and emotion.” Even for those who struggle to identify with these words, it’s hard to ignore the sentiment that Cédric (and many other mathematicians down the ages) is communicating: maths is undeniably personal. Why, then, do so many people think otherwise? Well, at least one explanation lies in the way that I’ve laid out these negative and positivde sides – namely, because of time. Maths at school _is_ often taught in a dry and unemotional way. It is often only upon “surviving” high school maths and making it to the university level – where students have far more freedom to pursue the mathematics that interests them, and to do so in an environment that is much further away from the suffocating pressure of endlessly comparing marks and ranks on standardised tests – only then do they often make the discovery that mathematics is something quite different from what they learned in the previous twelve or thirteen years of their life. It is a discovery that most make far too late, not to mention the fact that those who discover it are often the ones who in a sense need it least. Is it a mountain or a mole hill? But is this really that important? Let’s just assume this hypothesis is right: that mathematics education is deficient in this particular aspect. What difference does it make whether you’re missing one little ingredient here or there? Sure, the meal as a whole won’t taste as good, but is that such a problem? Answer: yes, it is. The reason why is because ingredients aren’t just about taste. Sometimes, ingredients are about survival. Take the air you breathe, for instance. You may remember from your high school science class that Earth’s air is a wonderful mixture of ingredients: nitrogen, oxygen, argon and a number of other gases. But did you know that the oxygen level of the air – which is about 20.9% – must stay within a tiny range to remain safe for humans to breathe? If it fluctuates by just a couple of percentage points, the results are hazardous to humans. In this case, getting the ingredients right is a matter of life and death. This is exactly the case we are in for our mathematics classrooms. And we are past the point of dangerous levels. While there are thousands of examples of effective teaching practice happening across the face of the planet, there are equal numbers – perhaps more – of classrooms where students are simply dying in terms of their desire for and understanding of real mathematics. So what? At this point, the easy option would be to point the blame at something external, sound angry at someone distant making poor decisions that place us as maths teachers in an impossible position, then dust off my hands and go home. Some easy targets would be the people who have written our current syllabuses and jammed the full of material, making it unfeasible to keep the breakneck pace required to cover everything whilst simultaneously giving ideas sufficient time inside and outside class to resonate emotionally with our students. Alternatively, we could attack the government bodies burdening us with ever-increasing amounts of administrivia that detract from the actual job of classroom teaching, and preventing us from investing emotionally ourselves in the pedagogical process for the benefit of our students. Or, we could pin the blame on parents who, according to the research, are primary contributors to the negative attitudes that many students themselves bring a priori into the maths classroom. However, while that would be easier and it might make us feel better for a little while (namely, for the fifteen seconds after you close this post until you forget that you ever read it), blaming someone else isn’t going to help us. Without absolving outside parties of their contribution to this troublesome situation, we still have a responsibility to own our part of the problem and take action to do something about it. And yes, us teachers on the front lines have an enormous opportunity to introduce change in our classrooms and start to make things better. For starters, we need to help our students recover the sense that maths is personal first, and procedural second. Notice that I said “recover”, not “obtain”. It’s been said that children are born scientists, with an innate desire to observe and experiment, but that our culture as a whole seems to actively discourage this impulse until the point that science becomes a foreign endeavour. I believe that a similar thing can be said about children as mathematicians. All young children seem to display a natural affinity for identifying patterns and solving puzzles. It is not difficult to see the joy in a child’s face when they first begin to master their understanding of numbers as quantity, then as order. The wonder and surprise that appears in a toddler’s eyes when they comprehend the algorithms and strategies needed to re-assemble a wooden puzzle is a beautiful thing to behold. Of course, no child (and few parents) would use any of this language to describe what is happening, but that does not diminish the reality that is there. And my point is that at a certain time, this youthful delight is lost and becomes replaced by a sense of drudgery and loathing when the word maths is uttered. This delight needs to be recovered, and I think that the seed of this emotion remains in every student even if it is dormant. As teachers, we have the privilege and responsibility to make learning personal for our students. It’s easy to lose sight of this in any subject area: History can focus on events and national structures rather than the people shaping them and affecting them; Science can focus on discoveries and models to the exclusion of the people who made them or are using them today; English can focus on techniques and genres in a way that distracts from the characters in them or the readers’ responses to them. But impersonal learning seems particularly endemic in Mathematics. To be called a “numbers person” often implies a form of unsociable eccentricity or a disdain for human relationship – hardly a flattering (or accurate) picture. So, as I said previously, we must recover the fact that mathematics is personal first and procedural second. What practical things can we do to start moving in this direction? I have three simple suggestions (among others) that we can all start acting on as soon as tomorrow in our classrooms: they are to do with individual conversations, classroom dialogue, and the narrative of our teaching. Before I explain any of these suggestions, I should point out that if we are trying to produce a personal attitude change in our students, then we must begin with our own personal beliefs and views of mathematics. These suggestions are not simple techniques that can be employed in an emotional vacuum and expected to successfully bring about change. They must come in the context of a teacher whose underlying attitude shows that they themselves are moving in a direction consistent with what these techniques are trying to convey. It’s self-evident that no one can lead their students to a place they themselves have not been. My first suggestion is to change the way we conduct individual conversations in the classroom. We interact with individual students hundreds of times over the course of a single week, and every interaction is a contributor to the overall atmosphere in our class. It is tempting to think that a single conversation is hardly a big deal, and that is true in isolation. But in the same way that a barrage of raindrops can cause a flood in the right quantities, the sheer volume of our student interactions means that every conversation creates an effect on our students and shapes their attitudes toward maths as a subject. Do you encourage students when they make mistakes, or do you berate them? Do you push students to understand why their answer went wrong or are you content to tell them the right answer and just implore them to accept it on your authority? Do you thoughtfully guide students in their struggle with a particular problem or do you just give them the first hint that comes to your mind? Where you sit on the spectrum of each of these questions will be decisive in determining whether your students appreciate and embrace the personal side of mathematics or not. Secondly, consider the dialogue you have with your class whenever you stand out the front of your room and converse with everyone at once. How would you describe the kind of verbal and body language you use when you are there? What sense do your words and tone communicate to your students about the subject matter you are engaged in (and that you are attempting to get them involved in too)? Does the way you speak show students that you have engaged in a personal struggle to understand this too, or do you come off as someone who effortlessly understands everything? Is your body framed and moving in a way that demonstrates your emotional engagement with the content you are about to share, or does it betray the fact that you are actually bored by what you are teaching? (And if we are bored with what we are teaching, then why are we ever surprised when students are bored with their learning?) Our success or failure to communicate genuine passion in our teaching will show our students, by example, whether it is worth personally investing in mathematics or not. Thirdly, there is enormous scope for shaping the narrative of our teaching in such a way as to constantly remind students of the personal journeys that lie just beneath the surface of the concepts and skills our students are working to understand. A perfect example of this presented itself to me this term when I was teaching geometry to my Year 8 class. As is reflected by many well-meaning textbooks, Year 8 geometry often begins with a review of the definitions and properties of various shapes (points, lines, polygons etc.) that were introduced in Year 7 and form the foundation of the Year 8 treatment of the topic. But there is nary a whisper of Euclid’s earth-shaking axioms, or Lobachevsky’s astonishing curved world, or Mandelbrot’s wrestle to reconcile the perfection of Euclidean polygons with the jagged self-similarity of the world around us. There is no hint of the fact that geometry is in fact a field in motion – being driven forward by brilliant and determined human beings – rather than a monolithic structure of knowledge delivered down from the heavens since time immemorial. That is why, in my introduction to the topic, I told my class to title this topic, “The Global/Historical Geometry Project”. This name that reflects the fact that they are doing much more than memorising stony propositions. They are, in actuality, dipping their toes into the great rolling ocean of geometric logic and reality – an ocean that humanity has been surfing for centuries. So, what do you think? Try these strategies in your classroom – and let me know how it goes! I’ve written before about how scheduled chats are one of the most powerful “features” of Twitter. I write that with quotation marks because they are more a function of social self-organisation than they are of the Twitter system itself. But nonetheless, the inherently real-time nature of Twitter makes this kind of discussion at home on this platform more than any other. In answer to the question: “Maths is either right or wrong.” Agree or disagree? Why or why not? In answer to the question: Can you be creative teaching maths, if so how? In answer to the question: Share one tech (app, website etc.) maths tool that you couldn’t be without. In answer to the question: What is your favourite strategy for engaging your students in mathematical thinking? In answer to the question: How do you teach maths cross curricular? There’s much more than that, and especially a lot of fantastic ideas shared by others. Check out the Storify of the chat (part 1, part 2) for more good stuff! 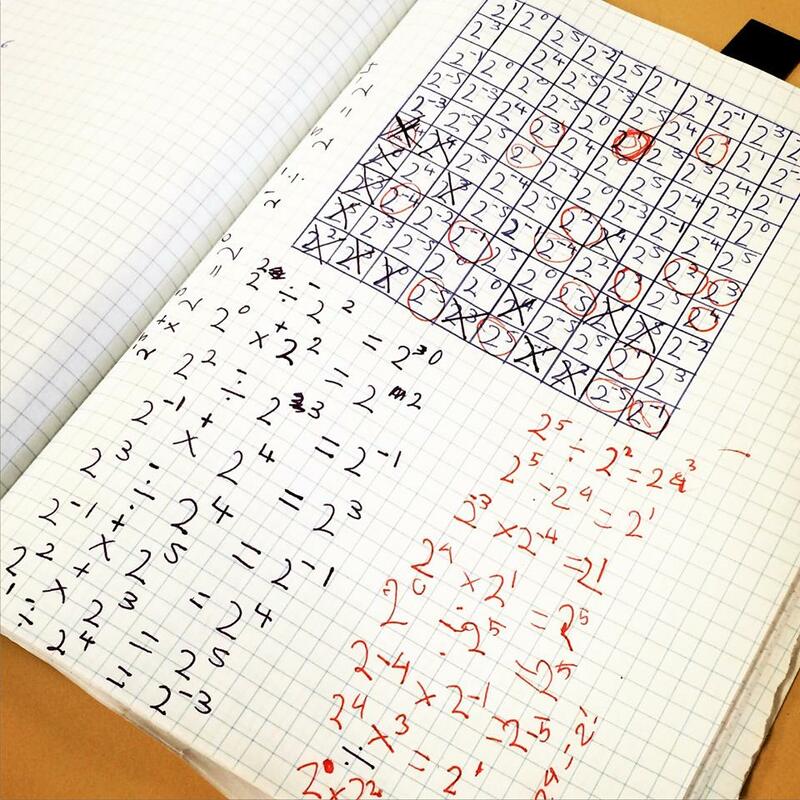 This entry was posted in Mathematics, Technology and tagged Blog. I’m endlessly searching for new ways to present and engage with old ideas. Some of the most wonderful experiences come from seeing or working with familiar things in a new way. So I was delighted when I discovered the game Nuxo on the iOS App Store recently. Download the spreadsheet and generate your own boards!